What's It Like To Be Bitten by a Snake? I don't know how many people are out there who can say that they have been bitten by a snake, but I unfortunately happen to be one of them. It's Scaly Saturday so I thought I'd share a personal story about my snake bite. I was working at a vet hospital assisting an exotic specialist. I was about 7 months pregnant at the time. 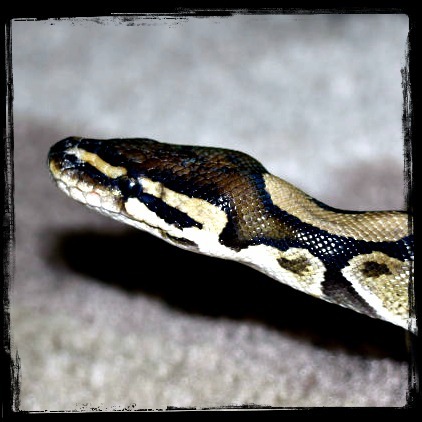 That morning, I checked in one of our patients who was staying for the day - a 10 year old ball python named "Lily". I find it funny because my oldest daughter's name is also Lily. I took the 3-foot snake to the back in her carrier and decided to place her in our warm incubator cage for the day. 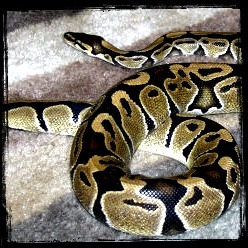 When I transferred her from her carrier to her new cage, she was very friendly - just as most snakes I've met are. The work day went on. I assisted my doctor on a number of appointments with guinea pigs, rabbits, and birds. It was nearing lunch time and we decided we should take a look at Lily the snake before we left to eat. I went to go fetch Lily from her cage and as soon as I put my hand in, she struck it and did not let go. I stood there for a couple of seconds, dumbfounded. Then I looked at another technician and said, "Um, help?!" I pulled my hand out of the cage, the snake had wrapped herself around the rest of my arm by now, still latched on to my hand with her teeth. I went over to one of our exam tables and put my snake covered hand on it. The pain was horrible! Oh, it hurt so bad and the snake didn't seem like she wanted to let go anytime soon. The doctor and everyone else started to pry the snakes mouth open, which hurt even more. After I was finally free I ran my wound under some warm water and had to take a trip to the doctor's office. The whole ordeal lasted about 3-4 minutes probably. Afterwards, it felt like my hand was on fire for about an hour. So why did Lily bite me? The doctor I assisted called Lily's owner to let her know what had happened. She said that the snake had not eaten in about a month. Remember that snakes don't eat that often. Also, my hand probably smelled like yummy and delicious mammal from all the critters I had been handling that day, even though I washed them frequently since I knew I would be handling a snake. The cage that Lily stayed in also probably smelled like all sorts of little yummy treats to her. I have been lucky and careful enough to avoid animal bites in the workplace throughout the years. I would have to say that this was the worst one I had experienced. Hopefully, I won't experience it again! Once bitten as they say. Glad it hasn't happened since. Have a super Saturday. I hope it doesn't happen again too! That sounds terrible! I would never keep a snake as a pet anyway- I think they're better off in the wild. They probably are, very true. That is a really interesting story which I enjoyed. Mommy is screaming right now and is up on top of the chair. I am glad that you are ok. I am glad it never happened again. Lol, thanks for reading. Glad you enjoyed the story. That sounds awful! What a naughty snake, even if she was very hungry. I do not blame her for the bite entirely. There were too many factors that caused her to bite me. Just like when dogs try to bite at the vet's office. Thanks for reading Remy!